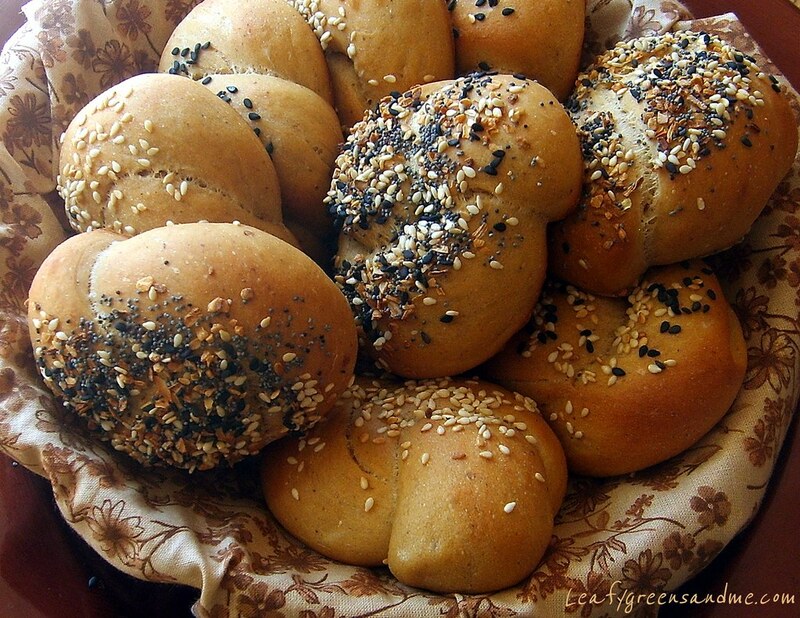 These whole wheat dinner rolls are definitely going to be on my dinner table this Thanksgiving. They're delish, fun to make and good for you too. I made an assortment of flavors using poppy seeds, sesame seeds and a combo with poppy, sesame, garlic, onion and sea salt. Serve them warm right out of the oven just as your guests sit down for dinner. I guarantee that they'll be at hit and be gone in no time! In a small bowl mix together water, sugar and yeast. Let sit for about 10 minutes for yeast to bloom. In another small bowl, add soy milk, agave, molasses and butter and heat in the microwave for about 15 seconds until butter is melted. Stir to combine and set aside. In a bowl of a stand up mixer, add all of the whole wheat flour and 1 cup of the white flour, along with kosher salt and ground flax. Whisk to combine. Form a well in the center of the flour and add yeast mixture along with soy mixture. Mix well with a wooden spoon until combined and then attach the dough hook and knead on medium (adding the remaining flour, 1 tbsp at a time until the dough pulls away from the sides and bottom of the bowl). Knead dough for about 10 minutes until dough is smooth and elastic. Remove dough from mixer and form into a ball and place in a medium sized bowl lightly coated with olive oil. Cover with plastic wrap and let sit for 1 hour to double in size. Cover two sheet trays with silpats or parchment paper and set aside. Remove dough from the bowl and divide into 16 equal 1-1/2 oz portions and form into balls. Keep balls covered with plastic wrap while forming dough into knots. Working with one ball at a time, and using both hands, form dough by rolling into an 8" long strip. Tie the strip of dough into a knot and fold the left and right ends under the knot, pressing lightly to adhere. Place dough knot on a flat surface and lightly shape into a round circle. Place knots on the sheet tray (eight per tray, spaced far enough apart to give them enough room to rise). Keep knots covered with plastic wrap, sprayed lightly with olive oil while you roll out the remaining balls. Once finished, keep covered and let knots rise again for another hour before baking. In a small bowl whisk together Ener-g egg replacer, water and soy milk. Brush each knot lightly with mixture and top with assorted topping of choice. Bake in the oven for 10-12 minutes until lightly golden brown, turning trays 180 degrees half way through cooking time.